Rebecca Bogardus will be offering introductory guitar classes to students ages six to 11 beginning later this month. These classes are part of the Kids’ Academy Classes developed by the Business and Community Education Department at McCook Community College. Bogardus will offer two levels of classes. 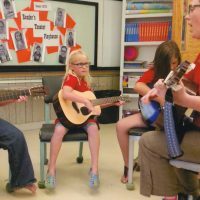 In the Guitar 1 class students will play favorite folk songs using the first three chords and will start learning to read music. After this first six-week sessions, students will be ready for the Guitar 2 class, which will begin the following week. In this class students will learn the most used chord progression of all time. It will let them play hundreds of popular songs and expand their finger- picking and music reading skills. Students need their own quality child-sized guitar or may contact the instructor regarding a rent-to-own option. Cost is $45. Bogardus has been teaching private and group music classes since 1998, including classes taught in public schools and for nonprofit art organizations. Her teaching experience includes flute, guitar, piano, choir, band, and orchestra. She studied flute at Brigham Young University and is constantly improving her teaching and musical credentials. She currently runs a private music studio in McCook and arranges and writes music. Kids Academy: Guitar 1 will be held on Wednesdays beginning Jan. 23 through Feb. 27. Class for ages six-eight will be from 4 to 4:30 p.m.; and ages nine-11 will be from 4:30 to 5 p.m. at McMillen Hall at MCC. The follow-up class, Guitar 2, will also be on Wednesdays, beginning March 6 and run through April 10 at the same times. For more information or to register for class you may go online to www.mpcc.edu/bce or call 308-345-8122.